Here are some useful tips on how to fold your shirt perfectly before you go outside. 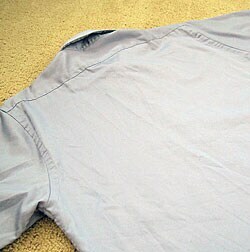 Step 1: Fasten the buttons on your shirt, including those on the sleeves and lay it face down on a hard surface. Smooth out any wrinkles or puckers on the surface. Step 2: Pinch the fabric at the midpoint of the shirt's shoulder, find its corresponding point at the bottom of the shirt, and pull it taut. 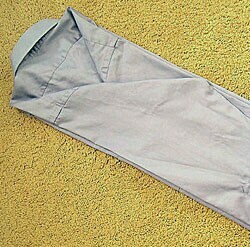 Fold the shirt along this line. Step 3: Fold the sleeve back on itself creating an angled fold at the shoulder. It should line up with the first fold. Repeat with the other side to make a neat rectangle. 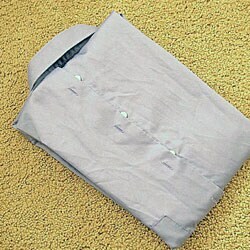 Step 4: Take the two corners at the bottom of the shirt and fold them up to the middle of the shirt. Make another fold upwards. 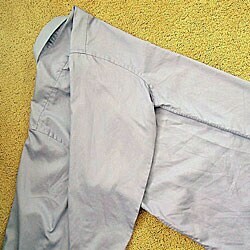 The shirt tail rests just below the collar.